A cousin and her husband were visiting from Sydney this past weekend. 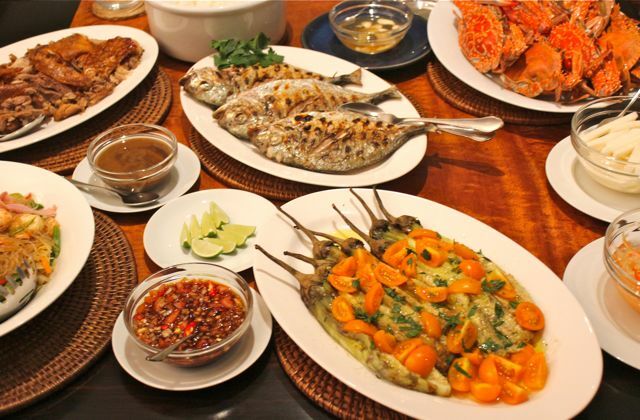 We invited them to the house for a home-cooked meal, and I assumed they wanted Filipino food. This is the spread we put out for dinner, with only 6 people eating that evening, there were a lot of leftovers (which were used in various dishes over the next few days). First up was a huge tureen of steaming hot Sinigang na Sugpo (sorry, forgot to take a photo). 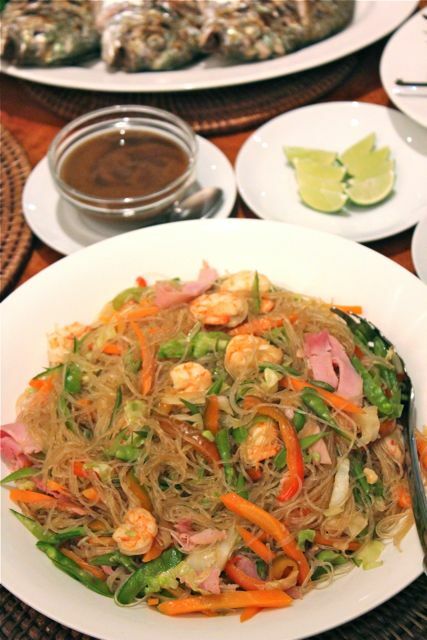 We had a shrimp and ham sotanghon noodle dish (the other half of the ham broth was used for a pancit molo the following day) which was served with some slices of dayap or local lime. A grilled eggplant and tomato salad provided some fiber and a healthier option. 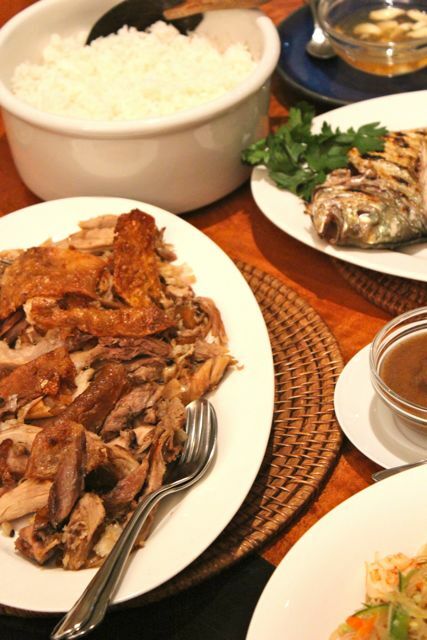 A platter of re-heated lechon, at cousin’s request. It turns out surprisingly good, though a tad drier than fresh if you bake it instead of flash-frying it after defrosting the lechon. Love how simple and colorful the fruit platter looked. First time I’ve seen mangosteens being part of a fruit platter. You know, MM, I really like how you present your food even if it’s just a no-frills dinner at home. 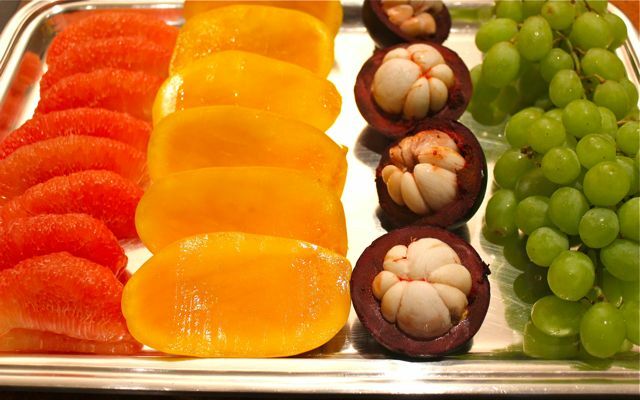 Even the slices of fruit, simply laid out on a tray, get a dose of elegance. I wonder though – do you warm your plates under a light or zap them in the microwave before ladling the food into them? What a beautiful fruit plate! Wish I could have some.. 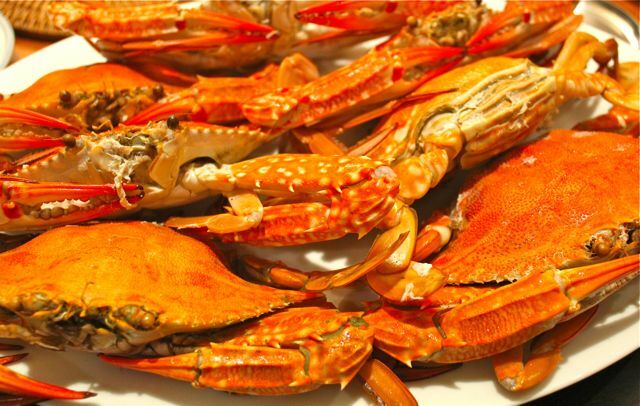 Thanks for the tip on how to easily get the meat of the crabs – chiling! Will really try it. Malou, perhaps the silver helps to amp up the elegance factor? :) But thanks for the compliment. A couple of things to think about when serving a fruit platter or basket… in more old-fashioned style meals of a generation past, a server/waiter would come around with a bowl or tray of fruit and you would pick one or two pieces and you would be skilled in opening it up and eating it with a fork, knife or spoon. Then you would have a finger bowl nearby to rinse off your fingertips… I know folks who can still eat their bananas without every touching the peel with their hands… But today, I find it’s best if you serve fruit that is, well, ready to eat, hence the peeled pomelos, mango halves, opened mangosteens and grapes. An added touch that is always appreciated is that the fruit is chilled before serving. In our tropical weather, consuming a slightly chilled mango half or mangosteen elevates the experience. However, on the flip side, a warm mango does seem to have a bit more intense flavor… I think I have written somewhere on this blog before that the best way to eat a mango is fully ripe off the tree, peeled by hand and eaten straight away, liquids dripping down one’s forearm and all. I like the tip on the crabs being chilled first before eating them. Thanks. Dayap! It works with pancit as well? It’s always been consigned to leche flan or juice at our house, but I’ll give it a try. Our substitute for calamansi has always been paper-thin slices of kamias. MM, thanks for your response. I suddenly remembered a manager/executive I worked for while doing my college internship nearly a decade and a half ago. Note that folks in the department rarely saw her since her day is always full of meetings. But one day, she joined us at the cafeteria and the lunch dessert was ripe mangoes, with the stone also available and on display for anyone who wanted them. She got three stones, none of the cheeks (? )and I couldn’t help but wonder how she’d eat them, seeing her looking so polished. Well, what do you know… she grabs her spoon and fork and then with the fork, she wedged the long end of the stone in between the tines, placed the stone flat side up on the plate and gently removed the peel using the spoon. Then she brought the mango up to her mouth, ate the flesh all around and did quick work of the rest. Seriously, hardly any mess on her chin and certainly no handwashing needed. I made serious mental note of that visual and have had on occasion used the same technique. I feel so chi-chi every time I do, hahaha. If I were one of the Sydney guests, I would have thought I have strayed in to the Land of Cockaigne. I guess that’s the difference between being fortunate, having close friends or relatives such as MM, and just being lucky, being able to peruse a blog like this. Footloose, only you would think to reference this that way. I took several art history classes, but I have to admit, I needed to look up a reference to the Land of Cockaigne. It wasn’t quite gluttony, but we did want to give the cousins sufficient choice… :) And we made good use of the leftovers. And as I have said before, the next time you find yourself in Manila or Cebu, you are invited to our table as the guest of honor. The eggplant looks simple, but yet so elegant. Im fasting and it seems a big mistake going here. Im drooling over the fruit platter. with crabs, we have always been taught to buy the live ones, still moving. then steam/boil them immediately once home and consume all. We never had leftover crab meat because they said it spoils easily. But here in the middle east i was surprised that there are no live crabs for sale. all are dead (even in the fish market ) or you can go buy frozen crab meat (which i never do since i get allergies from that). we have tried buying the dead crabs to try since all the people we know do that here and surprisingly, they’re ok (though nothing beats really fresh crabs ). Some say after cooking them, i can stick them in the freezer for a couple of days (3 at most) then reheat whenever you want to eat them. any truth in that? I agree with Malou, there is always a sense of elegance, class and style in how you serve your food no matter how simple/humble it is. Been taking notes of your silverware/kitchenware/tableware hehehe…. hope to build up my own collection someday. I always fail at making sotanghon! The noodles are either to overcooked – “malabsa” or they are not evenly cooked, some are ok some are still hilaw and some are malabsa. i have stopped trying to cook it to save my family from eating badly cooked sotanghon. Nice! The dayap slices sitting at an angle on both sides caught my eye, lol.